The area of British Somaliland had often been unruly but was seen by the British as strategically important for their interests in the Suez Canal and Aden. 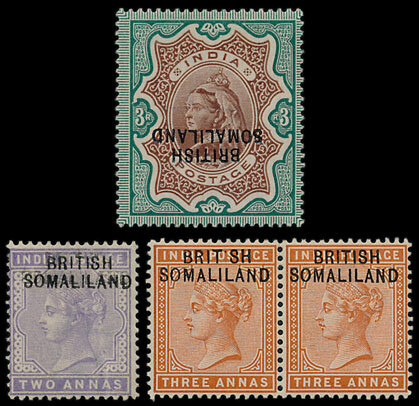 Control of the area was eventually passed to the Foreign Office and in 1901 the Indian Government responded to a request for an emergency issue of stamps by overprinting 13 Queen Victoria values to 5 rupees with ‘BRITISH SOMALILAND’. Distribution of the stamps was postponed for some time due to military operations against the ‘Mad Mullah’ and his Dervish Army who spent decades waging a guerrilla war against British control. The arrival of Indian troops stabilised the region and provided the opportunity to organise a postal system and in 1903 the overprinted stamps were released to the few Post Offices. As was often the case, the overprints provide various errors that are attractive to collectors. 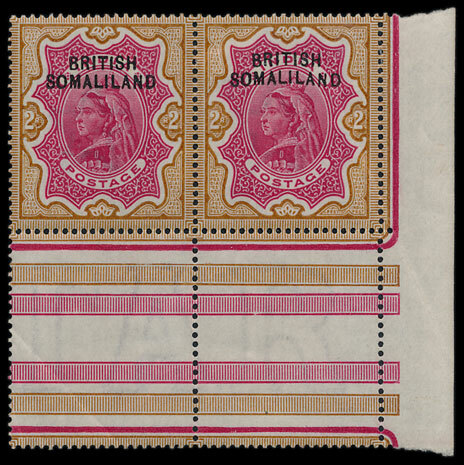 Our May stamp auction includes a collection of British Somaliland stamps, offered in 37 lots with mint examples of many of the errors, also covers and more substantial ranges. 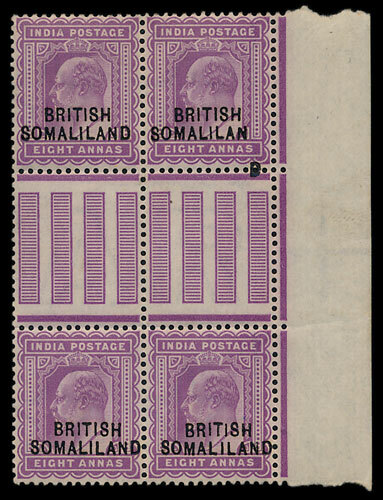 The auction includes a 2a pale violet with double overprint, a 2½a pair with ‘BRIT SH’ variety and a 3r with ‘overprint double, both inverted with one albino’. Striking 2r pair with ‘curved overprint’ variety. Later in 1903 Indian KEVII stamps, again overprinted, were distributed and again these included similar errors. 8a block including ‘thick dropped D’ error. 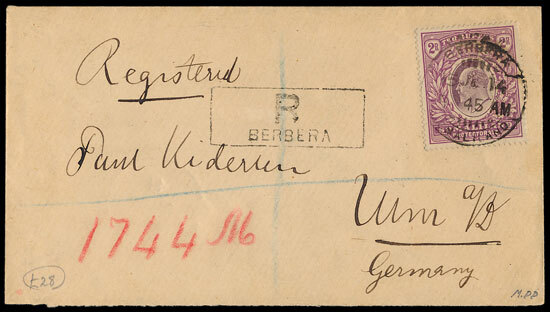 The collection also has some interesting covers, including a postcard to Germany with Berbera cancels. 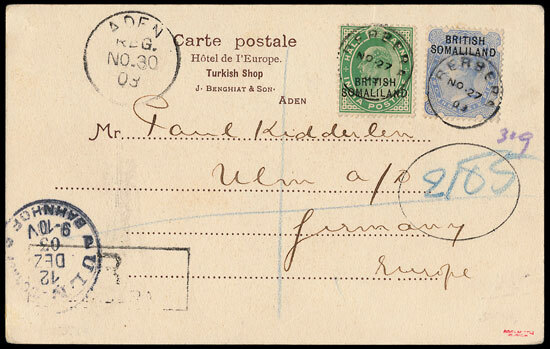 1904 2r envelope to Germany with Berbera h/s. 1811 Military General Service Medal with 4 Clasp Combination. 1811 NGSM 2 clasps to Lieutenant R.W. Innes R.N. 1814 Military General Service Medal 11 clasp combination, to a Bugler in 95th Foot.